This remarkable marathon of films from The Criterion Collection offers nothing less than a panorama of a hundred years of human endeavor. 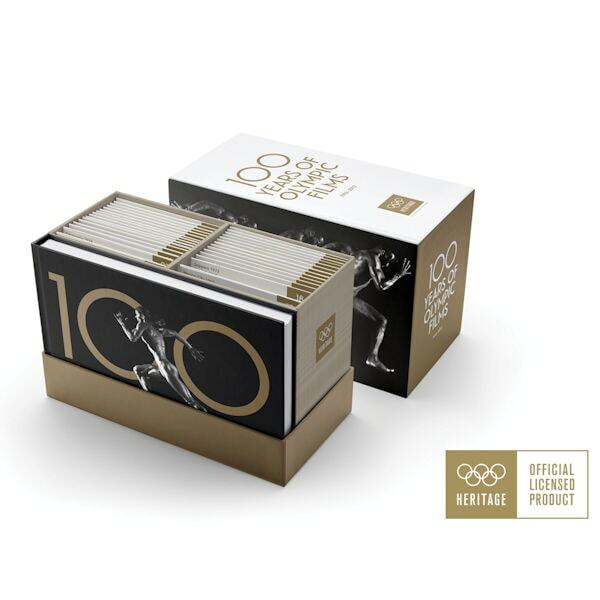 This one-of-a-kind collection assembles, for the first time, a century's worth of Olympic films. These documentaries cast a cinematic eye on some of the most iconic moments in the history of modern sports, spotlighting athletes who embody the Olympic motto of 'Faster, Higher, Stronger': Jesse Owens shattering sprinting world records on the track in 1936 Berlin, Jean Claude-Killy dominating the slopes of Grenoble in 1968, Michael Phelp's amazing run of gold medal glory, Usain Bolt's blazing dominance on the track, Joan Benoit breaking away to win the first-ever women's marathon on the streets of Los Angeles in 1984. 43 DVD or 32 blu-ray discs, 104 hours. Paris 1924: Sprinters Harold Abrahams (100 meters) and Eric Liddell (400 meters), later to be celebrated in the film Chariots of Fire, bring home gold medals for Great Britain. Berlin 1936: American runner Jesse Owens sweeps the track-and-field events with four gold medals (100 meters, 400 meters, long jump, and 4 x 100-meter relay). London 1948: Fanny Blankers-Koen, "the Flying Housewife" from the Netherlands, galvanizes the Games at the age of thirty with her gold medals in the 100 meters, 200 meters, 80-meter hurdles, and 4 x 100-meter relay. Helsinki 1952: The Czechoslovak long-distance runner Emil Zátopek wins gold medals in the 5,000 and 10,000 meters before also winning the marathon, despite never having competed in one before. Rome 1960: Ethiopian runner Abebe Bikila sets a world best with his barefoot victory in the marathon, becoming the first sub-Saharan African athlete to win an Olympic gold medal. Four years later, he will beat his own record, finishing first in the marathon at the Olympic Games Tokyo 1964—this time wearing shoes. Grenoble 1968: Jean-Claude Killy (France), the aristocrat of Alpine skiing, dominates the X Olympic Winter Games, with a triple victory in slalom, giant slalom, and downhill skiing. Mexico 1968: American Bob Beamon soars to a world record in the long jump with an 8.90-meter leap that still stands as the Olympic record today. Innsbruck 1976: Franz Klammer (Austria) wins the Alpine skiing downhill gold medal, besting the winning time from twelve years earlier on the same course by more than thirty-two seconds. Montreal 1976: Nadia Comăneci (Romania) scores the first perfect ten in the history of Olympic gymnastics—followed by six more. Lake Placid 1980: The United States ice hockey team narrowly defeats the heavily favored Soviet Union team in a medal-round confrontation that pulses with suspense up to its final moments—a triumph that becomes known as the "miracle on ice." Los Angeles 1984: Joan Benoit (USA) overcomes injury to triumph in the inaugural women's marathon. Sprinter Carl Lewis (USA) wins four gold medals, matching Jesse Owens's legendary performance at the Olympic Games Berlin 1936. Mary Lou Retton becomes the first U.S. athlete to win a gold medal in the women's individual all-around gymnastics event. Barcelona 1992: In a transition from the Olympic tradition of amateur athletics, the USA assembles a "dream team" of NBA all-stars to take the court. Perhaps the greatest group of athletes ever assembled in a single team, they win the gold medal, beating their opponents by an average of forty-three points per game. Beijing 2008: Jamaican runner Usain Bolt breaks world records in the 100 and 200 meters, celebrating with his trademark lightning-bolt pose as he becomes the first sprinter to set new records in both those events at the same Olympic Games.